The Welsh Rugby Union's proposed temporary takeover of Cardiff Blues has been called off. Blues chief executive Richard Holland said the region has made the "unanimous decision" not to pursue the option. 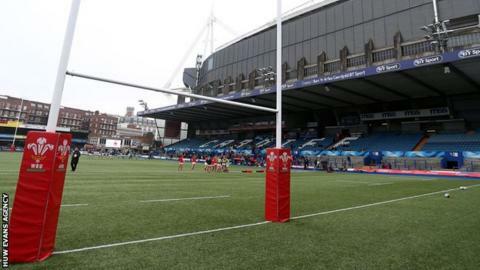 Holland added "amicable discussions" had been held on how the WRU could assist the region during the potential redevelopment of Cardiff Arms Park. "We will continue to explore the best way forward for the future of ... our region," he said in an open letter. Earlier in May WRU chief executive Martyn Phillips said the governing body was in "embryonic" talks over the possibility of taking over the Blues. Stadium redevelopment plans rest on Blues coming to an agreement over renewing their lease with Cardiff Athletic Club (Cac) that ends in January, 2022. That agreement appears to be a step closer with a Cac spokesperson saying: "I can confirm that negotiations are ongoing and we hope to call an EGM [extraordinary general meeting] in the not too distant future. "From a practical perspective this is unlikely to be in the next couple of weeks due to the Champions League Final (on 3 June) and the impact that it has on holding meetings etc." Cac is a body made up of Cardiff tennis, bowls, hockey and cricket clubs which has a clubhouse at the Arms Park. Blues boss Holland added: "With only five years remaining on the existing lease and the annual costs of maintaining the current facility escalating, the Cardiff Blues board are resolutely focused on extending the lease and redeveloping Cardiff Arms Park to provide a fit for purpose stadium for both Cardiff Rugby Football Club and Cardiff Blues. "The history and heritage of Cardiff Rugby at Cardiff Arms Park is of paramount importance to the board and it is essential to protect all elements of this great club and its iconic home. "We remain in ongoing negotiations with Cardiff Athletic Club regarding the granting of a new 150-year lease with development rights and are very hopeful of an agreement with the Cac management board." The announcement came after a vote that paved the way for the WRU to take over Blues' rivals Newport Gwent Dragons. Blues bosses have previously expressed a wish to redevelop their Arms Park home into a 15,000-capacity stadium. The plans include a retractable pitch and sliding roof so the stadium can be used as a concert venue, as well as building an exhibition centre, a hotel and flats. Holland also said in a statement he intends to explain "concept ideas" for the stadium revamp. He said: "These concepts are purely an indication of what could be achieved, from the replacement of the North and South stands to a complete redevelopment of the entire site, with the playing of rugby being the priority."